New England Patriots quarterback Tom Brady (12) walks off the field after Super Bowl LII against the Philadelphia Eagles at U.S. Bank Stadium. All week long, the only thing equal in force to Eagles fans' joy over Philly's first Super Bowl has been the city's frothing animosity toward Patriots quarterback Tom Brady. The history behind it is obvious and probably needs no repeating. People here, regardless of Brady's status as the greatest quarterback to play the game, hold him and the Patriots in contempt for breaking the rules of the game to get an unfair advantage — one that may have cost the Eagles a Super Bowl in 2004-05 (that's why the team staged a fake walk-through before this year's rematch). For the first time since his post-game press conference, Brady addressed the emotional aftermath of losing the Super Bowl. In an Instagram post, the 2017-18 NFL MVP harped on his feeling of gratitude. 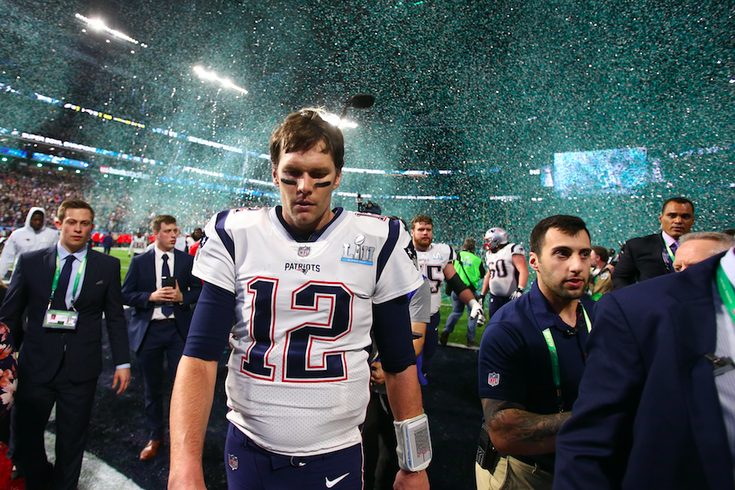 "Gratitude to the Philadelphia Eagles team and organization for bringing out the best in us and being gracious winners (as well as congratulations on winning the championship)," Brady wrote, barely stuffing that last bit into parentheses. Some Eagles commenters were not thrilled with the message. "Oh f*** off, arrogant prick," wrote one Eagles fan. "You showed how you deal with a loss when you refused to shake Foles' hand. Take your wishes and shove them up your *** sideways ****-***. Go Eagles!!" From an individual performance standpoint — minus that dropped pass — Brady had a phenomenal Super Bowl. He threw for a record 505 yards to cap a season with a league-best 4,577 yards and 32 touchdowns. That was one fewer than Carson Wentz had in just 13 games. No matter what Brady says, Eagles fans will have a hard time stomaching the idea that a 40-year-old, five-time Super Bowl-winning legend could walk off the field without ensuring that he caught up with Nick Foles. Someone will eventually ask Foles or Brady about what, if anything, has been said between them since the game. Foles will undoubtedly be a gracious winner with his answer.